A Union Army veteran and delegate from Bertie County to North Carolina’s constitutional convention of 1868, Robbins represented the county for two terms in the N.C. House of Representatives as a Republican, elected by county voters in 1868 and 1870. 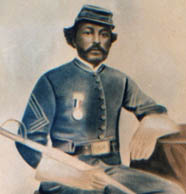 He later served as postmaster of Harrellsville, in Hertford County, for two years. Yet his most enduring claim to fame was as inventor. A carpenter and mechanic by trade, Robbins held U.S. patents for a cotton cultivator and a saw-sharpening machine, both granted to him in the mid-1870s. Robbins also built houses in Duplin County, where he lived for the last four decades of his life, and where he built and piloted a steamboat for years along the Northeast Cape Fear River. Born into a free, mixed-race family with Chowanoke Indian and mulatto ancestry, Robbins was the oldest son of John A. Robbins, a Bertie County farmer, and an unknown mother. He and his younger brother Augustus—also a state legislator in the 1870s—were apparently educated privately, perhaps at a Gates County school for Indians, according to one family account. This entry was posted in Chowan. Bookmark the permalink.